The Beautiful South, Los Angeles 1990. When I look back at the time I spent as a rock photographer, it's shoots like this that sum up why it can often be such a lively and fun job. It was a beautifully hot Los Angeles afternoon. 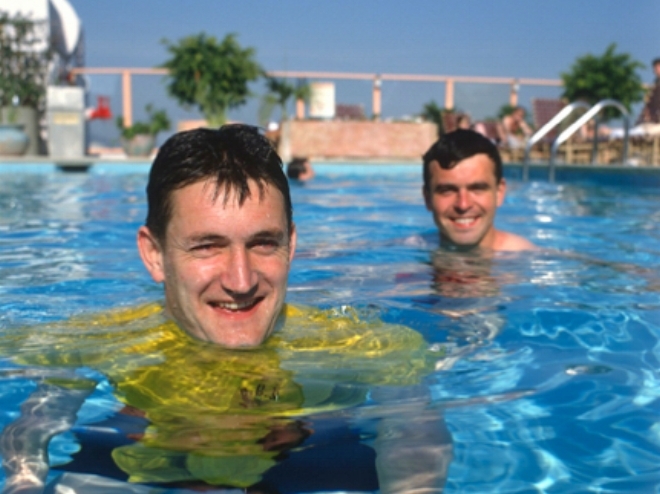 Paul Heaton and Dave Hemingway, from the band The Beautiful South were in the pool of a ritzy hotel. I can't deny it, I was even in the pool myself. And it certainly seemed like a good photo opportunity to me. It's a wonderful pool. It's right at the top of a very well known hotel on Sunset Boulevard and the views of West Hollywood and distant towers of Downtown Los Angeles are spectacular. For those that don't know, the Continental Hyatt House (or slightly more recently The Hyatt On Sunset) was the hotel most synonymous with the over the top, rock star antics of the '70s and '80s. At their peak Led Zeppelin would rent as many as six floors there and John Bonham apparently rode a motorcycle along it’s corridors. In 'Cocksucker Blues', the unreleased documentary about the Rolling Stones made by the legendary photographer Robert Frank, Keith Richards is seen chucking a TV off a balcony there. The Who often stayed at the Riot House during the days when Keith Moon was at his most outrageous. It's reported that he also threw TV's from the balconies there but, for him, that would have just been for starters. And the hilarious end of tour party scene in Spinal Tap was filmed around the very same pool. I suppose The Beautiful South would be about as different to Led Zeppelin or The Who as it would be possible to be and still be in the same business. Whilst I'm sure they must have had their moments of youthful excess, for the short time I spent with them on tour in California, they were about as quiet, friendly and polite as it would be possible to imagine a rock band to be. Me and the journalist, Stuart Maconie had met up with them a few days previously in San Francisco. There we had all been booked into the two story Phoenix Motel which, for some unfathomable reason, all the rock bands of that era also liked to stay in. Maybe, like the Riot House in LA, it was because the staff were similarly unconcerned by all the bacchanalia? Or maybe it was because the TV’s had less of a distance to fall? Whatever the reason, the Phoenix was certainly in a very rough neighbourhood, cheek by jowl with the notorious Tenderloin district. I suppose airborne TVs were the least of the area’s problems. On our first evening there, we went out with the band and some members of their road crew and managed to get into a fight. It's not quite the way I remember it. There were about eight or nine of us and we walked into what Stuart says was a Mexican bar called Spartacus. I was the first one through the door and even before I'd got up to the bar, for reasons best known to himself, a real tough looking character took a swing at me. I tried to duck and he only caught me a glancing blow on the shoulder. Call me old fashioned but I always do my best to avoid getting into bar fights, whatever the perceived justification might be. All the more so in countries where the police and a sizeable proportion of the citizenry own guns. In his book Stuart claims that a fight ensued and that pool cues were involved. I certainly didn't see any. The Beautiful South were just not the fighting with pool cues types. Not at all. All I remember is getting punched once and there was a bit of shouting. After which we all rapidly exited the bar. We were then chased a short distance up the street. So we simply walked around the corner and found a different, slightly more friendly bar to have a drink in. Does this story make me and the band out to be a bunch of wimps? I suppose so. It's not half as rock n' roll as Stuart's version. But if I'd ended up in hospital or in jail I'd never have had the chance, a few days later, to shoot the Beautiful South in the Riot House pool. A photograph which later graced the cover of the NME.